Minister of Health, Nutrition and Welfare, P. Dayaratne, and Minister of Tourism, Gamini Lokuge and Advisor to the Planning and Policy Ministry, Alizahir Moulana accompanied Minister Karu Jeyasuriya to the regions. Batticaloa-Amparai district special commander of Liberation Tigers of Tamil Eelam (LTTE), T.Ramesh, head of LTTE political section, Kauslayan, head of LTTE administration, Reginald met with the Ministers when they arrived at Illupadichchenai and joined them to the opening ceremonies for new electricity distribution arrangements. Parliamentarians Joseph Pararajasingham and Thangavadivel also accompanied the group of Ministers. Minister Jeyasuria unveiled the name plate at Karadiyanaru Junction main distribution point and ceremonially switched on power the electric supply grid. 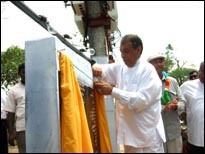 After a short break when the group had refreshments at the LTTE run 'Thenaham' guest house, the group travelled to Illupadichchenai and Pankudaveli where Minister Jeyasuriya again ceremonially switched power to local electricity supply lines. Sri Lanka Army (SLA) blocked electricity supply to these areas following the start of second Eelam war in 1990. 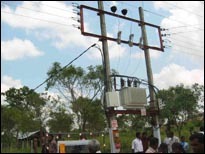 Under the scheme to bring electricity to Paduvankarai region in 1997, Kokkadichcholai received electricity supply, but Karadiyanaru region was left without power. The new supply scheme was the result of lobbying by Members of Parliament to the Power Ministry last year. The work was made possible by the financial support from Asian Development Bank (ADB) to the Rural Electricity Development scheme, ministry sources said.